This quick rise dough is ready so fast you must prepare your toppings first. In medium mixer bowl, combine 1 cup flour, yeast, and salt; mix well. Combine water and oil; heat to 120° to 130°F; add to flour mixture. Blend at low speed until moistened; beat 3 minutes at medium speed. By hand, gradually stir in enough remaining flour to make a soft dough. Knead on floured surface 3 to 5 minutes. Shape the dough into a ball, cover, and allow it to rest for 15 minutes. Divide dough into 2 equal parts. With well-floured or greased fingers, press each half into greased 12- or 14-inch pizza pans. Sprinkle ¼ cup of your favorite shredded cheese over dough to prevent a soggy crust. Spread prepared pizza sauce on each pizza (approximately ¾ cup of sauce per pizza). Add your favorite toppings---mushrooms, onions, olives, green peppers, pepperoni, cooked Italian sausage, anchovies, etc. Cover with shredded cheese of your choice- Mozzarella, Parmesan and Asiago. Bake at 400°F for 25 to 30 minutes until edge is crisp and light golden brown and cheeses are melted. Serve immediately. You can also substitute Red Star Active Dry Yeast on an equal basis for the instant yeast. Expect about a 50% slower rise time. Recipe featured at Barbara Bakes. Thank you for the your great products, recipes and information. I use your products daily. 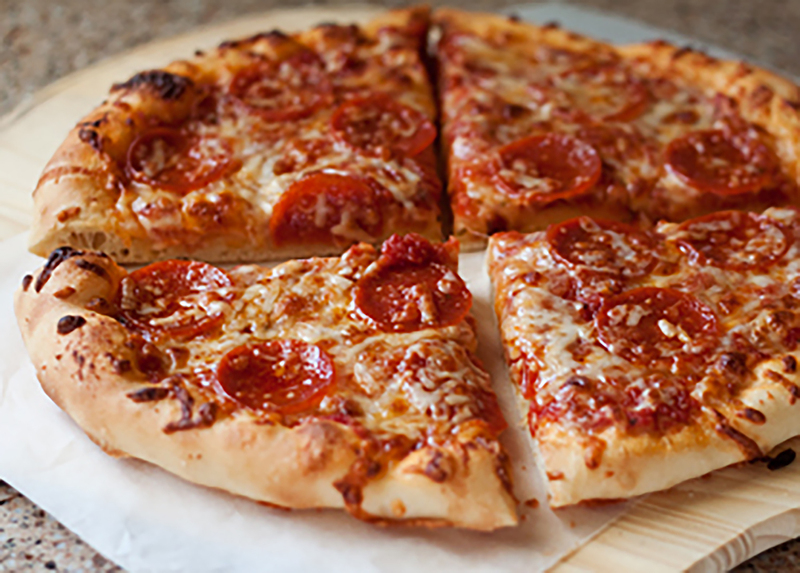 Great pizza recipes, pictures and steps. I have been making pizzas at home most of my life, and worked in pizza shops and delivered. I enjoy reading the informative comments from other readers and trying their suggestions. First time I made pizza and it was great! Also very easy. Everyone needs to try this, forget frozen. I added 1/2 TSP of Adams Reserve Classic Italian Bread Dipper seasoning (ingredients are garlic, rosemary, thyme, black pepper and parsley) to the dough … gave it really nice Italian taste. Yum. Rather than cheese first, try pre-baking your crust for 4 minutes, removing it from the oven and adding your sauce and ingredients…Cheese last. No more raw pizza dough. This recipe was easy and makes great crust! I sprinkle Sea salt and Corn flour lightly on greased cookie sheets. Makes crust even more yummier. I also spray edges with Olive oil and sprinkle sea salt and parm cheese on top! some people parbake and some brush with olive oil to prevent mositure from going into crust. This was my first Pizza I had made. We all enjoyed the Pizza I would say to all you should try it. Very fun to make we loved the way it tasted.